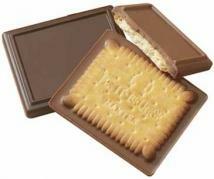 Custom Premium Swiss Chocolate plus cookies = a perfect mix. A low cost treat that can't be beat when you combine our delicious new butter cookies with mouth watering milk or dark chocolate...then top it off by molding your logo or message into the chocolate. Now you've got a way to advertise that people will be excited to get. How many times have your customers asked "May I have another one of your ads please"? Low cost and delicious. Choose Milk or Dark Chocolate. Tradeshow Hit !!!! Product Weight: 1.25 Ounces. Product Size: 3" x 2 1/2". Imprint Area is 2 1/2" x 2". Packaging: Individually cello wrapped. Buy 1.25 oz Custom ChocolateSquare Cookie Today!